The U.S. Army‘s 71st Ordnance Group and 10th Chemical Hazardous Response Company have conducted the final wave of tests for a new body armor designed to be modular, customizable and lightweight. 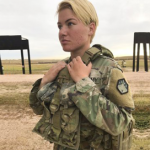 The Army said Tuesday the recently concluded trials on the Modular Scalable Vest was part of a week-long series of tests in October at Fort Carson, Colorado. Stephen McNair, test manager for Project Manager – Soldier Protection Individual Equipment, stated that the Army expects to go into production after the evaluation and begin utilizing the vests by summer 2018. “We have been working on this vest for the past five years and have since have gone through four versions of the vest and an additional two versions of the soldier plate carrier system,” he said. McNair added that MSV aims to reduce the weight of a soldier’s load. MSV is a component of the Soldier Protection System, an update to the Personal Protective Equipment system, and has a base weight of 11 pounds. The Army noted that MSV weighs approximately 25 pounds once fully configured, which is five pounds lighter than the Improved Outer Tactical Vest that MSV was based on. The new tactical vest also employs a four-tier configuration consisting of an inner soft concealable armor, a plated soft armor, ballistic plates and a ballistic combat shirt in efforts to make the vest scalable and tailorable to the user’s mission needs. The outermost layer works to protect the user’s neck, shoulder and pelvis and also contains a utility belt designed to store items around the user’s hips. Developers at the Army’s Program Executive Officer – Soldier are also developing a new lightweight protective helmet system to supplement MSV, the service branch said.